Two former executives with a company that make generic drugs were charged this week for alleged roles they played in a bid-rigging and price-fixing scheme that involved a diabetes medication and an antibiotic. 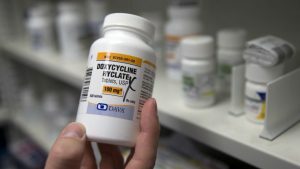 Former CEO of Heritage Pharmaceuticals Jeffery Glazer and the former president of the company Jason Malek were named in two separate felony cases that are related to the alleged scheme that involved glyburide a diabetes medication and doxycycline hyclate an antibiotic that treats bacterial infections. The scheme, outlined in the court documents, ran from the early part of 2013 through December of 2015. Through entering into agreements that were unlawful to allocate consumers and fix prices the two former executives looked to gain monetarily at expense of the vulnerable and sick who rely on access to less expensive generic products as alternatives that are more affordable than brand name medications, said prosecutors in the filing. These charges are just the first that have been announced in a federal probe that is continuing aimed at ensuring that pharmaceutical companies making generics compete to provide the essential products at prices that are set by the market and not through collusion. Both of the executives were fired in August by Heritage following the company’s own internal investigation that revealed serious misconduct by the same individuals named in the suit. Heritage said through a prepared statement that the company was cooperating fully with every aspect of the Justice Department’s investigation. The statement added that the company had recently initiated its own action legally against the two same individuals seeking compensation for the elaborate self-dealing embezzlement scheme. The statement concluded by saying the company was highly disappointed by the two’s misconduct and was committed to ensuring that it did not happen again. Heritage, in another lawsuit filed against Malek and Glazer accused the two of looting the company of tens of millions of dollars through the misappropriation of its opportunities, obtaining compensation fraudulently and embezzling intellectual property. Malek and Glazer were able to accomplish the theft through the creation of a minimum of five dummy companies, which were used by the two to siphon off profits of Heritage through a number of racketeering schemes. The lawsuit alleged. Lawmakers cited the soaring price of doxycycline during the conspiracy as it jumped to $1,845 from $20 in a span of just 7 months between late 2013 and early 2014.